The Ocklawaha Chapter NSDAR participates in many activities through chapter committees focusing on service to our community, nation, and to veterans. The following is only a sample of current projects and activities. The American Heritage Committee has worked extensively with the Quilts of Valor Foundation to create and distribute quilts to American Veterans and to soldiers in Iraq. By recent count the QoV Foundation has distributed 197,635, nationally. Recently, quilts were provided to a U.S. Navy WWII veteran and a Silver Star – U.S. Marine. Fifteen lap size quilts were presented to veterans at Cornerstone Hospice and five quilts were made and presented for the Hope and Dreams Quilt Challenge to support PALS (patients with ALS – Lou Gehrig’s disease). The Ocklawaha Chapter’s 2018 DAR American History Essay Contest winner was awarded the Florida first place prize at the state conference. 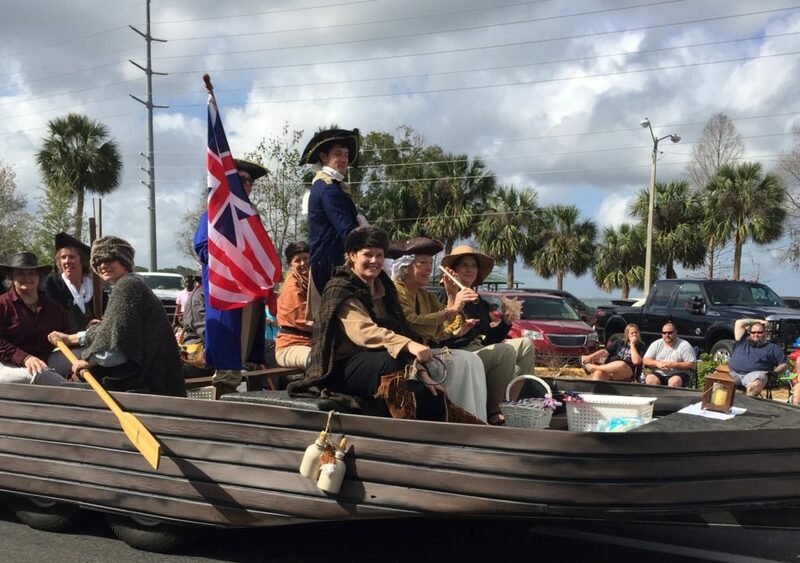 Our chapter launched an exciting float for the 2018 Eustis George Fest Parade: Washington Crossing the Delaware. The project included building General Washington’s boat, creating Revolutionary War costumes, complete with swords, and energizing the record crowd of Lake County parade watchers. The George Fest 2019 theme is – We’re Launching Into The Future. Our chapter will celebrate by marching in costumes depicting the many occupations that women have succeeded in tackling in the last one hundred years. The Commemorative Events Committee celebrated the beginning of Constitution Week by participating in – Bells Across America. The Ocklawaha Chapter NSDAR organized the observance in Eustis by encouraging the public to bring their bells and ring in the yearly observance of the anniversary of the signing of the U.S. Constitution. Eustis Mayor, Robert Morin, participated in this year’s event. The DAR Museum Outreach Committee’s mission is to foster an understanding and interest in the DAR Museum (housed in Constitution Hall in Washington D.C.) by bringing the museum closer to DAR members and local communities. The committee presented one of the Museum’s Portable Education Programs – The Colonial Household – to the chapter on December 8, 2018. The program brought to life the struggles of colonial women who maintained families, households, and farms, with few conveniences or technologies. DAR Project Patriot works closely with the Operation Paperback (a non-profit, national organization) to ship donated books to serving military and their families. The chapter organizes books by genre in order to send service members exactly the types of books that they are most interested in reading. To date, the chapter has sent out over 2600 volumes. Ocklawaha Chapter NSDAR members participated in the National Veterans’ Wheelchair Games in Oviedo, Florida, in August 2018. In 2019, we will be participating in the Flightless Veterans Honor Flight. Members of the Lineage Committee have been reaching out and networking with local genealogy groups to assist in a greater understanding of the DAR and genealogical research. The registrar spoke to the Mount Dora Genealogy Society, during the Summer of 2018, and someone from the committee will be presenting to the Tavares Genealogy Group in 2019.